It was Friday night and I went to walk my dog and something in the air didn’t feel right. The minute I walked in the door, it started sounding like all hell was breaking loose outside my house. I just figured it was the rain we’d be praying for and made my way back to the couch to watch some TV. Then the power went out and didn’t come back on. I tried to shrug it off, lit up the lanterns I had bought that day (for some odd reason) and hit the hay soon after. It wasn’t until the next morning that I found out what happened…a tornado had touched down a couple of blocks from my downtown home. WTF?! I still had no power and wouldn’t for another 24 hours. No power meant no coffee (a major problem for this caffeine fiend), so I went out to breakfast at The Original Pancake House. My Mom used to take me here all the time and the nostalgia made me feel right at home–something I needed on such a bonkers day. The line were long, but it gave me a chance to read up on the night before and the counter staff was nice enough to pour us some coffee as we waited. 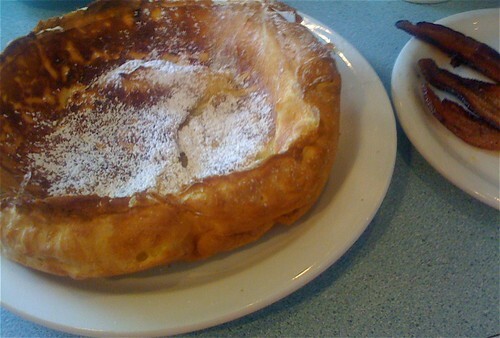 After being seated, I took stock of the massive menu and decided to have something new–the Dutch baby pancake. For those of you who don’t know, the massive pancake is baked in the oven where it rises and collapses when taken out. It is served with lots of whipped butter and lemon wedges. What is nice about this pancake versus other styles is the lightness. I didn’t get that sluggish “I just ate a plate of pancakes” feeling. The bacon was crisp and my grapefruit juice was freshly squeezed. The coffee kept coming and I really couldn’t have asked for more on such a crazy morning. Still a great spot after all these years. Good to know about this location. I used to work in Stone Mountain and the location on Memorial Drive in an old A&W restaurant was a favorite breakfast-for-lunch spot – about the only thriving eatery in that area. It is no longer on the menu but I think you can still order bacon and basted eggs – essentially sunny-side-up basted with butter with thick cut bacon. It comes with pancakes and I substituted the buckwheat for the standard fare(extra charge.The buckwheat was better than average with the little dark specs in the batter. I think different locations may have somewhat different menus/ingredients since the buckwheat I had at the former Peachtree Rd location didn’t measure up. I, too, love OPH. It all started when I lived in Los Angeles. Dutch baby is my fave and always the item I order. The only thing that bums me out is the limited hours of operation. 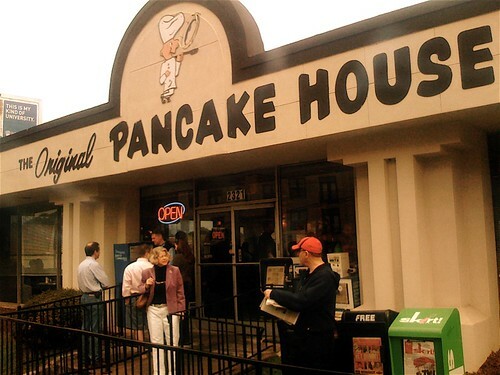 i used to loooove OPH…then a couple of years ago I had food poisoning from some corned beef hash I had there 🙁 …haven’t been back since…altho I feel like going back everytime I go by there for those chocolate chip pancakes! I just found your blog! Google Reader recommended it to me! It’s wonderful!!! Can’t wait to keep reading. 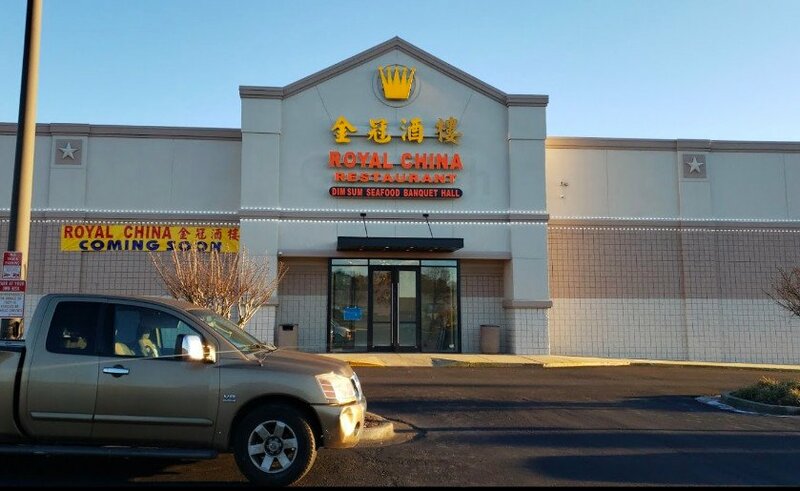 The Peachtree City location has closed up and left town . . .
i live by the OPH in michigan, its my favorite place to eat on earth.